The Malta Foundation Programme was officially launched in July 2009. It is an Affiliated Programme to the United Kingdom Foundation Programme. This means that the Malta Foundation Programme is the same as the UK Foundation Programme. Its operations are based on the same Reference Guide and offers the same Curriculum and educational and training opportunities as official UK Foundation Schools. The setting up of this programme followed negotiations between the Division of Health Care Services of the Ministry of Social Policy, Health, the Elderly and Community Care of Malta and the United Kingdom Foundation Programme Office. 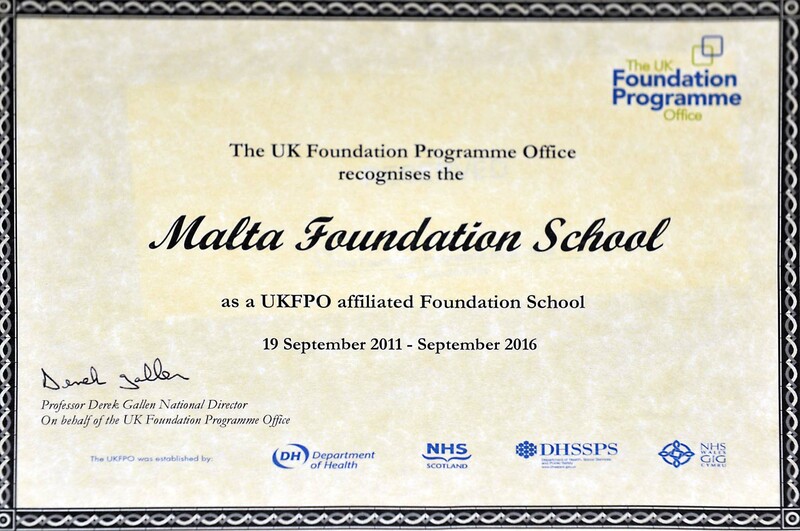 The Malta Foundation School was granted re-affiliation to the UK Foundation Programme on the 19th September 2011 for a further 5 years after fulfilling the Quality standards of the Medical Council Malta and the UKFPO. The re-affiliation certificate can be viewed here. In 2014, the affiliation was renewed by the UKFPO and extended to September 2019. In March 2018, Health Education England renewed the affiliation of the Malta Foundation Programme to the UK Foundation Programme until September 2022. * Candidates who wish to seek eventual full registration from the Medical Council in a country other than Malta, should seek advice from the respective Medical Council as prospective approval from some of that country’s institutions may be required. Persons graduating from a UK Medical School who would like to eventually seek registration with the UK General Medical Council are advised to seek written approval from the post-graduate Dean before joining the Malta Foundation Programme.